With a stay at Pleiada Boutique Hotel And Spa in Iasi, you'll be near the airport and close to Palace of Culture and Metropolitan Cathedral. 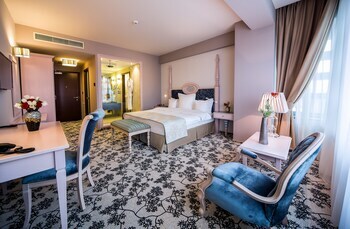 This 5-star hotel is convenient to University of Iasi. Pamper yourself with a visit to the spa, which offers massages, body treatments, and facials. You're sure to appreciate the recreational amenities, including an indoor pool and a fitness center. Additional features include complimentary wireless Internet access, concierge services, and wedding services. Guests can catch a ride to nearby destinations on the area shuttle (surcharge). Featured amenities include a business center, complimentary newspapers in the lobby, and dry cleaning/laundry services. This hotel has 2 meeting rooms available for events. A roundtrip airport shuttle is provided for a surcharge (available on request), and free valet parking is available onsite.